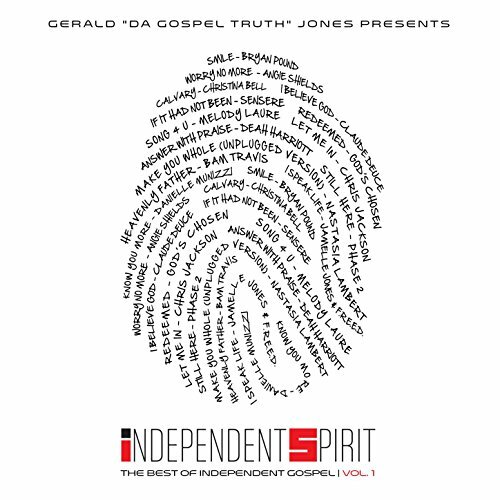 New Music: Gerald 'Da Gospel Truth' Jones Presents Independent Spirit, Vol 1. Today is a great day because it is the official release date of my good friend Gerald 'DaGospelTruth' Jones first project, Gerald 'Da Gospel Truth' Jones Presents Independent Spirit, Vol 1. with some amazing artists. This is the first installment in a series that shines light on, and provides a platform for, the undercurrent of great "independent' gospel music. Gerald and I worked together as producers for the Fox TV show, Divorce Court. Even as a TV producer Gerald always had his hand on the pulse of what was hot in music. When it comes to gospel he knows his stuff. Anything he puts together is an automatic recommend! Independent Spirit, Vol. 1 features "If it Had Not Been," by gospel soul band SENSERE, and other brand new music from some of the hottest unsigned talent in the country. This compilation is a stunning hand-picked collection of 14 ear-worthy Gospel songs from an impressive roster of largely unknown diverse talent. The project features all new music from Deah Harriott, Bam Travis and Chris Jackson (Toni Braxton, Tank, The Isley brothers) in addition to songs from Bryan Pound, God's Chosen, and Danielle Munizzi to name a few. PLEASE make sure you head over to iTunes or Amazon and download this today! The song "I Believe GOD" is special on the album because Gerald Jones actually cowrote it with his music partners @justindjuane & @carloswoodard. I am super proud of my friend! He is bringing fresh new music to the market and allowing us all to be inspired by amazing new artists that we may have never heard of otherwise. Support Gerald and these emerging independent gospel artists by downloading one of the many the singles or the whole album below. Watch Gerald talk about the album in the video below. Sidebar: Congrats Gerald! I bought my copy! Mixed Bag Music Group, Llc. We are super excited for the release of "Independent Spirit, Vol 1", available now at iTunes (https://itun.es/us/c_n28) & Amazon (http://amzn.to/1LHqOz2) and other digital services! Learn more about this unprecedented compilation of 14 up-and-coming independent gospel artists, curated by blogger, songwriter and A&R exec Gerald "Da Gospel Truth" Jones.